The Grand Budapest Hotel is the best appreciated film of director Wes Anderson. The film is about the rise and fall of the prestigious Grand Budapest Hotel, its concièrge Gustav and the charming lobby boy Zero. When Madame Celine Villeneuve Desgoffe und Taxis is murdered, all search for the priceless painting of 'Boy with Apple'. We follow the adventures of Gustav and Zero while being introduced to the history of Central Europe in between two world wars. Wes Anderson has his unique film style and cinematographic language and this film is a chain of breathtaking highlights in art direction. The hotel has been designed in three time periods, the costumes fit the bizarre characters perfect and ofcourse, the drinks and snacks in the films are memorable. The film is Engels spoken and Dutch subtitled. 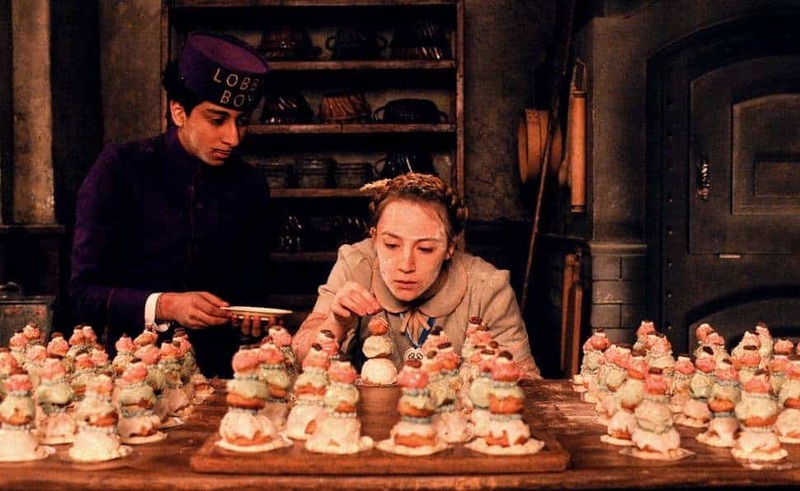 Ofcourse, the Cinema Culinair version of this film cannot do without the Courtesan au Chocolat of patisserie Mendl. You drink what you see in the film. Good film + good drinks + great timing. The clou is in the timing. An example. When Gustav drinks a Pouilly Jumet at minut 19 and 11 seconds, you do exactly the same. One minute earlier or later determines whether it's a good experience or an excellent one! The essence is to experience the film with all senses. when is the next shof of this film? keep me posted about upcoming shows!